We’ve just released our weekly Sector Snapshot report (see a sample here) for Bespoke Premium and Bespoke Institutional members. Please log-in here to view the report if you’re already a member. If you’re not yet a subscriber and would like to see the report, please start a two-week free trial to Bespoke Premium now. Below is one of the many charts included in this week’s Sector Snapshot, which shows the percentage of stocks trading above their 50-day moving averages by sector. Breadth readings have exploded higher this week, with 80% of S&P 500 stocks now trading above their 50-day moving averages. 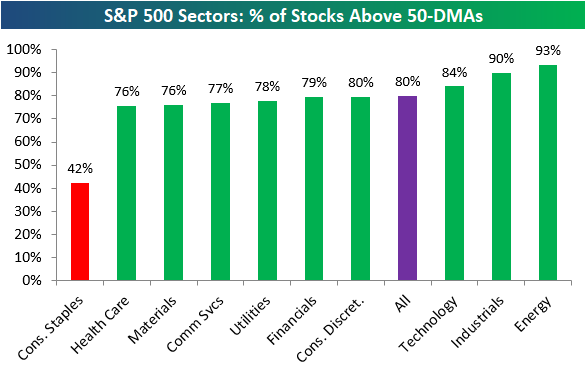 Ten of eleven sectors have more than 75% of stocks above their 50-DMAs, while Consumer Staples is the only sector with a reading below 50%. To find out what this means and to see our full Sector Snapshot with additional commentary plus six pages of charts that include analysis of valuations, breadth, technicals, and relative strength, start a two-week free trial to our Bespoke Premium package now. Here’s a breakdown of the products you’ll receive.